The sheep are coming in less than a week and Matthew has been working long hours making our fencing more secure for the sheep and putting in new fence posts and gates. The fencing will be an added security measure to keep the sheep in their pastures along with the temporary fencing we will use to practice more intensive rotational grazing. It is also a way to keep the wee ones out of the two ponds. Luckily there have been some calm, not too hot days to make the long days easier and of course some little helping hands. It all started with the first new fence post that the gate secures to alongside some impromptu sculpture that the little hands made when they were tired of helping. Then came the all important H-brace, three wooden posts and wire, that create an anchor for the rest of the fencing and also attach to the gate. Once the H-brace was finished and he secured the pasture fencing to it, he attached the end of the fencing to a bracket he made that was hooked on to the tractor's bucket and pulled it tight against the old fence posts. Then all that was left was to secure the new fencing to the old posts. So simple, right? I'm glad my job was just to explain it to people. 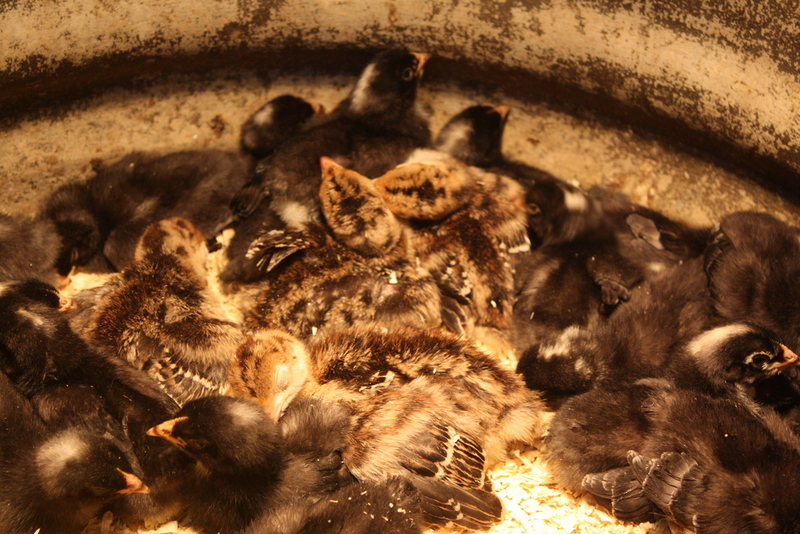 The week would not be complete without some pictures of the napping Chicks and Poulets. I love it when they sleep in a heap, when they sleep in pairs, but especially when they fall asleep in their feeder(which we didn't get a picture of but trust me it's adorable).